Tracker music (also called module music and MOD music) is one of my favourite music formats, yet a lot of people do no know what it is. People who listen to music on a computer are more likely to be familiar with the major audio file formats: linear audio (most commonly WAV/PCM1 and AIFF), lossy compression (MP3, Ogg Vorbis, AAC) and musical score (MIDI), but not with tracker music. This is a shame, because tracker music is a delightful format with low file sizes and a unique, charming sound that has been around since the late 80s, generally going unnoticed amongst the majority. Like MIDI files, they are also fully editable. So what is tracker music? 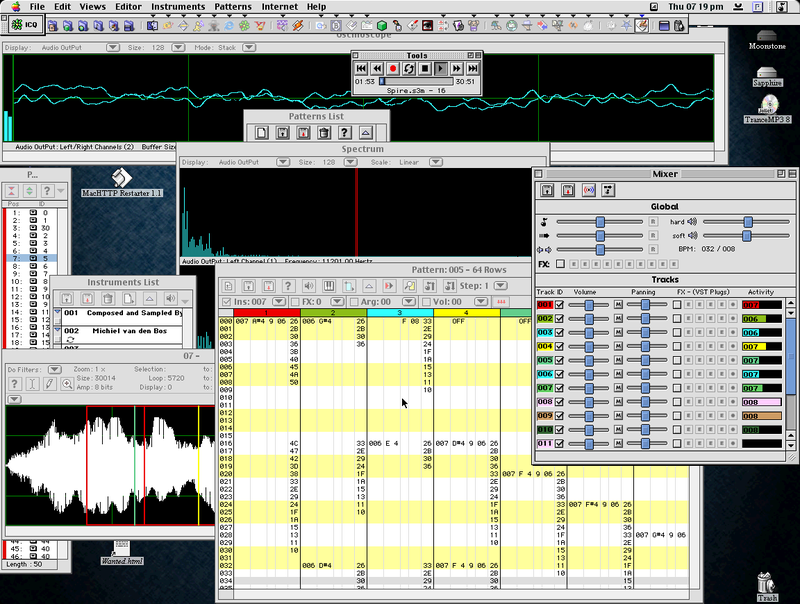 Tracker music is a music file format which contains not only a score (like MIDI does), but recorded samples of all the instruments used as well. Anyone familiar with wavetable audio will make a connection here: a wavetable sound card is analogous to a hardware MOD player. MIDI music on a computer has traditionally been limited to the quality of the synthesiser present in the sound card. While MIDI music from a PC sound card has a charm all of its own, the format has some limits. Synthesised instruments have traditionally failed to come close enough to their acoustic counterparts, and you are mostly limited to the in-built set of instruments as to what you can play. With OPL-based cards, you can bypass the MIDI instrument stage on the card and program the OPL chip directly to define your own waveforms; Epic MegaGames composer Dan Froelich was fond of this technique. Nevertheless, this will still only afford you rudimentary waveforms and is just not comparable to feeding the card wave audio. The most significant flaw is that the same tune played on different models of sound card can sound very differently depending on what synthesiser chip the card features, or whether for example MIDI is performed in software (such as on the Macintosh). Tracker music overcomes these limitations by playing back recordings of the instruments according to the score. With copies of the instrument sounds stored within the tune file, the tune will sound virtually the same on any computer of any age, and you may utilise all manner of exotic instruments and sound samples in the tune, including vocal samples. The end result is an interesting sound: not as smooth and clean as studio music, but nevertheless impressive. It has even be used to emulate the sounds of classic sound chips in early home computers; these are known as “chiptunes”. The original MOD music started on the Commodore Amiga home computer in the late 80s. The Amiga didn’t have a synthesiser chip, which was probably a wise decision considering how poor PC audio was at the time (anyone remember AdLib?) Instead, it had a four-channel wave audio subsystem in hardware. As I understand it (sadly, I never owned such a machine), software could feed instrument sounds to the hardware along with the pitch and volume at which to play them. The hardware would generate all the notes (including pitch bends) and mix them. The end result was so far above the AdLib synthesiser that in terms of quality that the AdLib was left in the dust; music on the Amiga was stunningly captivating. I remember getting Lemmings for the PC (bundled with my first sound card) and being disappointed with the cheap tinny music (and low-resolution graphics) of my PC, compared to the Amiga. The format did not die after the Amiga became obsolete: it has lived on over the years not only with its fans, but also modern game developers. It has been the standard sound format for the demo scene – a community of people devoted to producing high quality digital audio and graphics (Claus Volko’s aforelinked article details the history of the demo scene). Hungarian demo group Exceed’s popular and beautiful Heaven Seven intro features a captivating MOD soundtrack which even in its fully stand-alone XM format (available to download) fits 2:48 minutes of mystical, dreamy audio into 85 kilobytes: enough data for five seconds of MP3 audio at average quality. The entire intro itself, including music, MOD player, texture generator, realtime ray tracer, bitmaps, 3D objects, script and Windows runtime fits into a self-expanding 64 kB program! Heaven Seven is well worth watching (requires DOS or Windows). Musician Robert Allen and game soundtrack producers Straylight Productions have both used tracker music to great effect in their video game soundtracks. Robert Allen was responsible for the soundtracks to the Epic MegaGames titles Jazz Jackrabbit, One Must Fall 2097 and Epic Pinball, and Straylight produced the soundtracks for Jazz Jackrabbit 2, Deus Ex, Unreal and Unreal Tournament amongst others. All of those games feature excellent soundtracks, and demonstrate very well the superb abilities of the tracker music format. I will be fair, though, and admit that Dan Froelich’s Xargon soundtrack (again for Epic) – written as Creative Music Format programmed OPL – was also spectacular; the PC sound card can synthesize very decent music when used effectively. Of course, more modern tracker music has not stuck to the old four-track Amiga MOD format. There have been several sets of improvements over time. One is the switch from 8-bit to 16-bit instrument samples for noticeably cleaner audio. Another is a far greater amount of tracks available to musicians. The Amiga could only mix four audio channels together, so you could only hear four notes being played at once (four track audio). While this is plenty enough in many cases, you get a much richer sound when you expand the limit. You can now have far more notes being played at once in modern formats; PlayerPro has a checkbox to let you restrict the number of concurrent notes to 48, for example. Newer trackers and players also support extra effects to increase the expressiveness of the sound. There are a variety of tracker music formats around. The original format was Amiga MOD (.mod) in its varieties and with its siblings; these are often known as ProTracker MODs after the Protracker music tracker (editor). More modern formats include Scream Tracker 3 (.s3m), Impulse Tracker (.it) and Fast Tracker 2 eXtended Module (.xm). The story is far more complex than that, but these are the most common formats and file extensions. Other extensions you might encounter include .mtm (MultiTracker Module), .669 (Composer 669), .med (Amiga MED/OktaMED) and .okt (Amiga Oktalyzer). Tracker music in video games tends to have alternative extensions or be stored in exotic wrapper formats such as .psm (ProTracker Studio Module, used in Epic MegaGames software) and the .umx Unreal Music file format. There are many programs available for playing tracker music, and there is something for pretty much every platform, even Psion EPOC. (If you can’t find one, install an Amiga emulator ;) Under Windows, just use the ubiquitous Winamp. In Mac OS 9 and earlier, you can go with a whole load of programs; my favourite is the all-purpose SoundApp, although it cannot play the popular XM format. MacAMP handles more formats and gives some fantastic equalisation, but it is a bit buggy and can crash the computer. Mac OS X users can try CocoMod. Linux users already know where to go. I would be remiss in not mentioning the custom format. Most Amiga game music was comprised simply of tracker music data, but a number of programs were more technical than that. Instead of using a regular music format, custom software was written to play the music. The advantage to this was probably to recycle external instrument sounds to keep the file sizes down. This makes it slightly difficult to play on a computer other than an Amiga, as you can imagine. The workaround for Windows users was to write software that emulates the Amiga processor and sound hardware, and actually run the custom music code under emulation. The main program for this is DeliPlayer although there is a less-effective Winamp plugin that also supports custom MODs. Custom format music has been a bane of mine because no such program exists on the Macintosh. The real problem for me was that Lemmings and Battle Squadron, of all games, both use custom format music, and these are two of my favourite soundtracks. Someone called Reed at the exotica Amiga forums created an accurate cover version of the Battle Squadron title tune, which was nice; this tune is posted in the samples section. I have since bought a Windows PC and installed DeliPlayer instead! For this section, I will be referring to a tracker screenshot I made of a program called PlayerPro, a Macintosh MOD tracker: a program used for creating and editing tracker music. In the screenshot, it is shown playing one of the tunes from the Unreal soundtrack, Spire. Try not to be too put off by the number of open windows, though; I’ll explain all the ones that matter one at a time. Something I am sensing, though, is that different tracker authors use very different terminology for the different parts of a module (what are called “partitions” in PlayerPro are called “orders” in MultiTracker, for example), so consider the following to be merely a rough guide to the terminology. The first window to look at is the mixer window on the right – this lists all the tracks, their volume, panning (stereo control) and what instrument they are currently playing. The number in the Activity column shows the number of the instrument that the track is playing; you will notice that there are lots of instances of instrument 7 being played. You can also use this window to alter the pitch and tempo of the whole tune (independently of each other) on the fly, apply VST effects (not a good idea on a 200 MHz Mac), and make other adjustments. On the left, there is a window titled “07 -” – this is the waveform for instrument 7. The area in that window surrounded by a red box is the section that gets looped when the sound is sustained, and the three lines (turquoise, red and yellow) show whereabouts in the instrument waveform the different tracks have got to (fun to watch). There is even a feature to let you edit and draw in a new waveform – including on the fly while the tune is playing – with the mouse. Tunes are made up of logical sections called patterns – a pattern is a piece of digital musical score. In the pattern window in the middle, you can see such a pattern – pattern number 5. Each group of columns holds the score for a track, and you can see that the colours match those used in the mixer window. For each track, the first column is the instrument number, and the second is the note and octave to play. The remaining columns control other parameters of the note such as portamento. Finally, the complete tune is made up of a list of partitions, which are played in sequence. Each partition simply references a particular pattern to play, letting you repeat patterns and change the order in which they are played. If you wanted to repeat pattern 5, for example, you could have two partitions in a row that are set to play pattern 5. On the left, you will see a window titled “P…” – this is the partition list. You will see that partition 7 uses pattern 5, and that partitions 11 and 13 both use pattern 9. When the tune is played, the partition list defines which order all the patterns get played, which for Spire is 0, 1, 30, 2, 3 and so on. The oscilloscope and spectrum windows are just fun to watch. So, you will now be wanting to hear some of this of this music for yourself (I can hope, at least). Thus, I have provided below a list of tracks you can listen to try out the format, chosen from my collection of favourite tunes. The only downside to tracker music is that it generally gets used for what Americans call techno, so anyone who cannot stand techno will have a bit of a problem finding digital modules (MOD tracks) that actually suit their tastes. The Lemmings music is universally delightful, though. Those not of great techno inclination would be advised to try Cleared for Take-Off, Chizra and Labratory Level first in the sample tracks. Lots of tracker game music, both modern and classic, can be found at the Mirsoft World of Game MODs. There is also a nice retro music station on the Internet, Nectarine Demoscene Radio, that plays a lot of tracker music. Non-game music should be easy to find with a Google search, although get in touch if you want some more music to try out. And don’t forget Heaven Seven! First posted 14th March 2004; last revised 20th September 2009. 1Bet you didn’t know that there were MP3-encoded WAV files, though.